Located in the north quadrant of Palm Springs, the neighborhood of Desert Park Estates is a popular residential area known for its affordable home values and its wide range of architectural styles. Within fifteen minutes away from excellent schools, the Palm Springs International Airport, and local amenities, this community is incredible convenient. Desert Park Estates homes for sale make an ideal space to raise your family, start your new life in Palm Springs, or retire in view of picturesque mountains. Continue down the page to browse Desert Park Estates homes for sale, or take a closer look at surrounding amenities. For complete access to Desert Park Estates real estate listings, register for free. Afterwards, you'll be able to create custom searches to help you narrow down results, bookmark your favorite homes, and more. On quiet streets named after some of the early Hollywood's most famous actors, Desert Park Estates homes for sale come in a broad range of building styles. On East Powell Road which takes its name from actor William Powell, you'll find relaxed bungalows on landscaped lots made up of pristine white gravel and cacti. 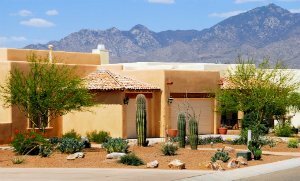 On East Wayne Road, named for the Western superstar, there is a mixture of Spanish style beauties with corrugated tile roofs and boxy adobe desert estates. East Joyce Drive takes its name from the famed author and is the site of some of the most luxurious homes in this neighborhood. Here backyard pools and floorplans over 2000 square feet are the norm. Inside, these properties reflect the age in which they were built. Some date back as early as the 1950s while others are still being built. Modern homes brag spotless white interiors, open-concept designs, and hardwood flooring. Others are made up of warm amber hues. Maple cabinets, beige walls, and marbled taupe floor tiles mimic the desert landscape. In other homes, you'll find industrial kitchens with stainless steel appliances and granite counter tops. Gas fireplaces help you shake the chill of a cool evening, and funky wallpaper prints add a dynamic feature wall to popular living spaces. With large plans, these homes are intended for families to make the most of them. Spacious kitchens mean that you aren't hindered by a compact space when you're preparing meals. A private office affords you a space where you can develop documents for work, school, or pleasure in a productive focused space. Large living rooms provide an ideal space where you can watch movies with family and friends or delight in good conversation. Not only is Desert Park Estates real estate affordable and comfortable, it's also in a prime location. Parents with school-aged children will find that this neighborhood is within a few blocks of The First School of the Desert, Montessori Elementary School, Vista Del Monte, and Raymond Cree Middle School. Frequent travelers are only a five minute drive from the Palm Spring International Airport, and on the nearby intersection of East Vista Chino and North Sunrise Way, you'll find an Albertson, a Walgreens and several other helpful retailers. With paved sidewalk at every opportunity, this neighborhood is highly walkable. If you like to jog in the cool desert evening or walk your dog in view of the San Jacinto Mountains, you'll enjoy strolling down these well-maintained walkways. If Desert Park homes for sale sound like an ideal living situation for you, contact me, Palm Springs real estate agent Geoffrey Moore, today. With a track record for excellence, I can help you find the perfect home that fits your lifestyle. Based on information from CARETS as of April 25th, 2019 at 12:46pm PDT. The information being provided by CARETS is for the visitor's personal, noncommercial use and may not be used for any purpose other than to identify prospective properties visitor may be interested in purchasing. The data contained herein is copyrighted by CARETS, CLAW, CRISNet MLS, i-Tech MLS, PSRMLS and/or VCRDS and is protected by all applicable copyright laws. Any dissemination of this information is in violation of copyright laws and is strictly prohibited. Any property information referenced on this website comes from the Internet Data Exchange (IDX) program of CRISNet MLS and/or CARETS. All data, including all measurements and calculations of area, is obtained from various sources and has not been, and will not be, verified by broker or MLS. All information should be independently reviewed and verified for accuracy. Properties may or may not be listed by the office/agent presenting the information.